Ready for some cool stuff? 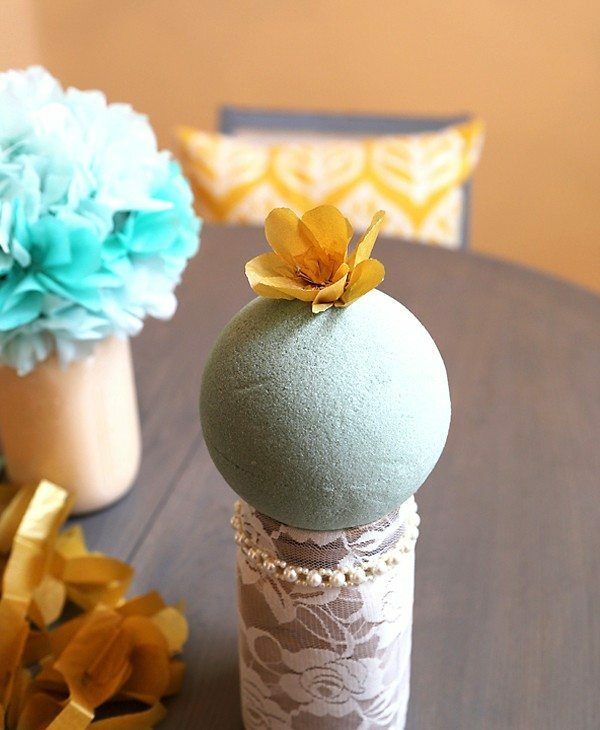 How about DIY Mother’s Day Gifts that will only set you back about $10 or less? I’ve always been a big fan of homemade gifts. Doesn’t it feel amazing to know someone spent time and put thought into a sweet gift for you? Remember Kelly? 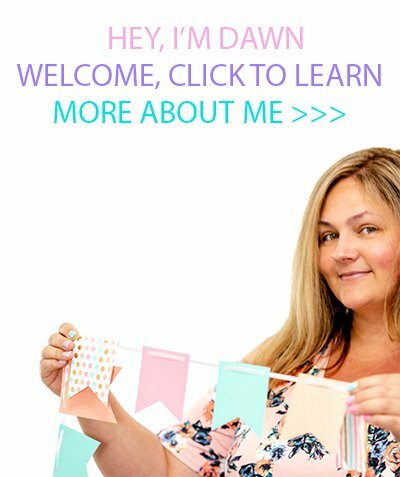 She’s worked really hard behind the scenes to share step by step tutorials on how to make this the sweetest Mother’s Day ever! Let’s jump right in! Even though this is so simple, it’s SO cute! 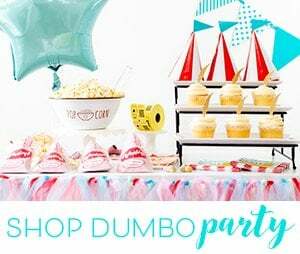 It is easy to put together and with all the color tissue papers you can choose from and the endless options for decorating the base, this cheap DIY would make an awesome gift! I decided to add color to my mason jars that I used for the base. I had some paint samples leftover that I poured in to the jar and then rolled the jar slowly till all the sides were evenly coated and I left them outside to dry for the day. One of mine was too dark for my liking, so I used some stretchy lace that I had left over from a sewing project and created a sleeve. I hot glued the mouth of the mason jar and placed a Styrofoam ball on top. Flower Time! Me and my trusty sidekick Netflix conquered this part together. I find leaving the tissue paper folded like the way it comes out of the package the easiest way to get through your cutting. That way you’re cutting multiples at one time. This part is very forgiving, you don’t have to be precise in your cuts. I cut approximately two inch strips from the folded paper and then accordion folded them about two inches wide. I then traced the shape of the flower petal (this can be whatever flower petal you like) on the folded paper with a flat band at the base to keep it all together. Once it is cut out, on each strip you’ll run a needle and thread through the bottom band from one end to the other, weaving through about every half inch. After it is threaded, hold both ends of the thread and gather the petals into the flower shape. Once it looks the way you like, knot the thread off to keep the shape. Once I had a bunch of flowers ready, I start gluing! I decided to use two colors on mine and kept the design simple. I really love how they turned out! Now I need to pick one for mom. For this example, I purchased a wood frame at Michaels for about $4.00 after coupon. I painted a base coat of Coral Acrylic Paint (from Target) and let that dry. Once it was dry, I cut out piece of the lace that was slightly larger than the frame. I sprayed the frame (painted side) with my spray on adhesive and pressed the lace down onto the frame, making sure the lace was nice and taunt across the whole frame. Once the adhesive was dry to the touch, I flipped the frame over and traced around the outer edge with hot glue. 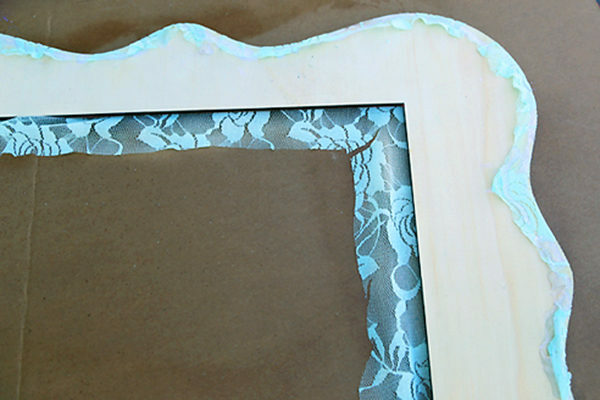 I stretched the lace around the edge of the frame and pressed it down into the hot glue to hold the shape. Once the glue was set, I trimmed off the excess lace. The interior edge was a little more tricky! I cut the lace about an inch from the interior edges, and made small diagonal snips in the corners, leaving about a half inch uncut from each corner. I repeated the process of hot gluing and stretching the lace around the frame on the interior side. Whew! The last part was adding the cloths lines to the frame. I measured out two strands of florist wire to match the width of the frame and then stapled the wires to the frame. You will want to use shallow staples if the wood frame is fairly thin, trust me! I wrapped the wire around the staple and twisted it back on itself to secure each end of the wires to the frame. I also stapled the hanging string to the top portion of the frame. I used some decorative string that I had laying around, but of course you can use what ever suits you. 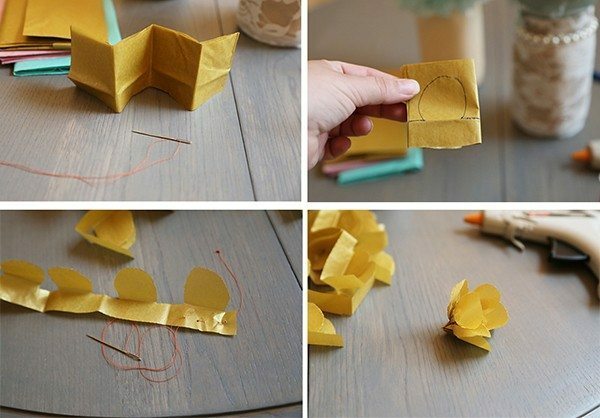 Use the mini clothes pins to hang whatever inspires you! You can use a canvas or wood frame for the base. If you use a real wood base, you can use Command Strips to hold the picture frame on the base and could easily change out the pictures as you want! I chose canvas because I could get the look that I was wanting easier and it is more forgiving when correcting a painting error. Being able to get a two pack of large canvases from Hobby Lobby for less than five dollars (after coupon) may have played a role too. I painted my first canvas with a base coat with acrylic Tiffany Blue paint that I picked up in the new Hand Made Modern section at Target. It paints on beautifully and evenly, and it dries SUPER quick. I painted the second canvas’ base coat with acrylic Coral, also from Target. Within 10 minutes, they were dry and I painted completely over the Tiffany Blue canvas and the edges of the Coral with some Valspar interior paint (Peach). I let that sit for ONLY 5 minutes and then placed it in the grass and turned my hose setting to JET. Yep, I sprayed them down with the hose! I wanted to give them a textured chic look and this turned out perfect. The canvas dried within minutes and was ready for the picture frame! At this point, you could use stencils to add a design for some additional personality of your own. I went with plastic frames that I found at Target on clearance for $0.60 cents! They are easy to paint and light enough for gluing to canvas. I think the hardest part was trying to pick the pictures for the frame. Next, I had to attach the frames to the canvas. I marked where I wanted them to go with a regular pen, generously applied glue to the backside of the frame (picture in frame) and placed it where I wanted it! I applied some pressure then moved on to my next one. 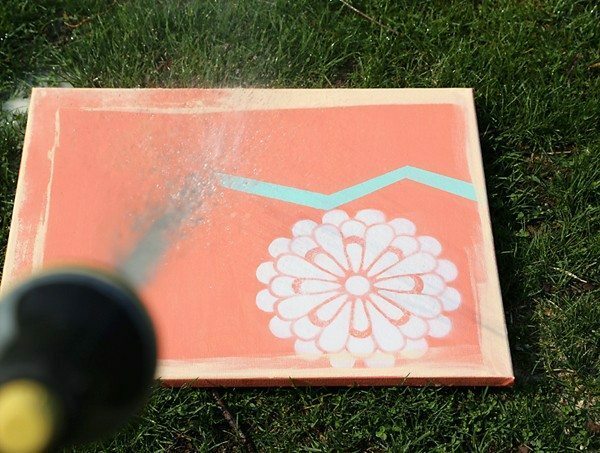 This is a quick, cheap, and cute project that’s good enough to gift, too! That’s it! 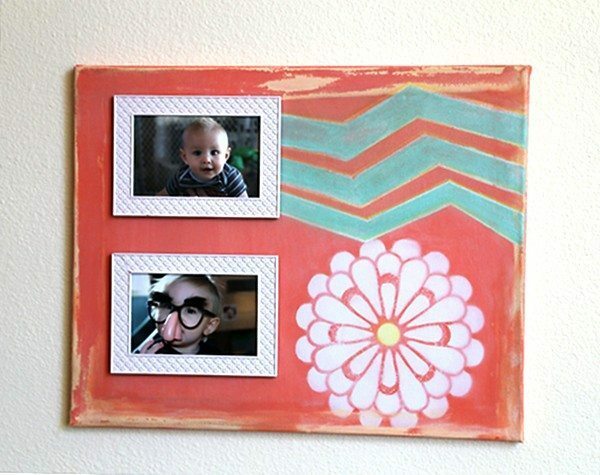 Now you have three budget friendly DIY projects made special for mom! 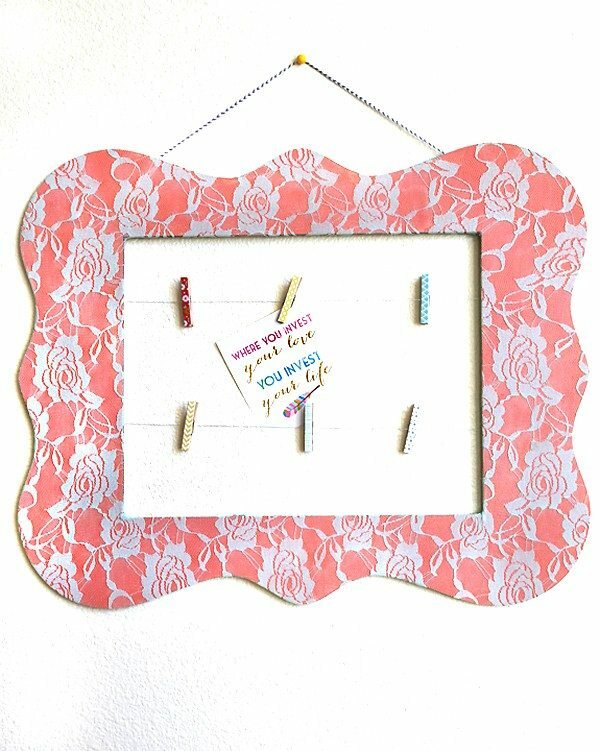 If you’re looking for another inexpensive idea, make sure to check out how to make a framed Mother’s Day gift with this free printable. Which of these gifts is your favorite? Great ideas! I love simple and inexpensive DIYs. I love them all! But, especially the Photo/inspiration board!! So creative! 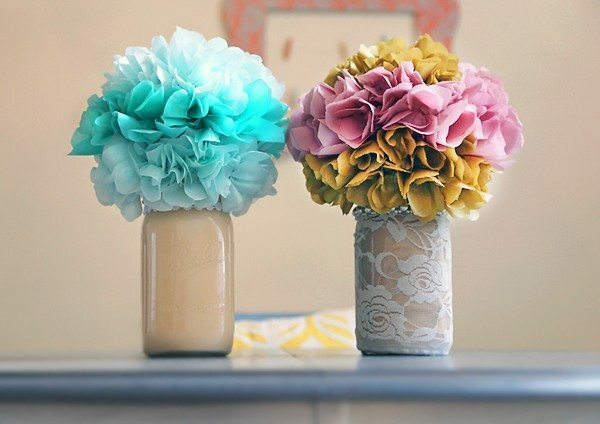 Love tissue mason flower jars. Beautiful!